With significant Drupal site building experience and Qualified Teacher Status (with a Physics degree) - I provide the very highest quality Drupal training. Public, scheduled Drupal training workshops in London, private Drupal training anywhere in the UK and online Drupal training too. 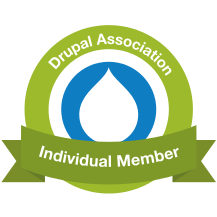 With more than three years experience of delivering my own hand-crafted Drupal training courses (to hundreds of different clients) - you can rest assured that your training experience will be second to none. I have worked as a software/technology trainer, web-developer & consultant with a number of large organisations - including: Panasonic UK, Nokia UK and Software AG. My most relevant key skills are Drupal, PHP, mySQL, Apache, Linux, CSS, & SEO (I have significant integration middle-ware knowledge & experience too). I have worked on a number real-world, Drupal projects, both large and small, over the past six years. DRUPAL TRAINING: I develop and deliver my own carefully constructed Drupal training courses. I have significant experience here - having trained for some large organisations including Oracle (Oracle/Siebel CRM platform) and for the industry leading IT training company in London - Learning Tree International (courses on Web Development, XML and UML). I am a fully qualified and experienced teacher too (BSc PGCE - don't you know) so you can rest assured training is professional, focused, well paced and engaging. DRUPAL WEBSITES: I have been directly involved in web development, in one form or another, since 1999 - having previously graduated in Physics and taught for a few years. I have over six years experience as a Drupal Site Builder. I now use my skill set and experience to operate on my own account and offer businesses/organisations of all types and sizes a very personal and highly professional service - building/maintaining/developing websites on the award winning open-source Content Management System (CMS) - Drupal. My interests, other than Drupal, include: current affairs, real-ale, running, walking the Border Collie rescue dog (most walking routes allow for combining the real-ale interest too) and my Triumph Street Triple.